The Penn State Board of Trustees took many actions Friday, including naming three new members to its executive committee. The new committee members are Kathleen Casey, a senior advisor with Patomak Global Partners; Donald Cotner, president of Cotner Farms; and Rick Dandrea, an attorney with Eckert, Seamans, Cherin & Mellott. The board approved all three nominations without discussion or opposition. The executive committee has 13 members. The governance committee was tasked Thursday with nominating three at-large members to the executive committee. In committee, Keith Masser, chair of the board, recommended all three candidates. Committee member Barbara Doran also recommended Ryan McCombie, a retired U.S. Navy Captain and SEAL. Doran argued during the committee hearing there is a need for more alumni representation on the executive committee. Due to changes in bylaws the three new members will only serve until July, which is when new elections will occur annually. The shift to July allows more participation by board members. The board also unanimously reelected Masser as chairman of the full board. Afterward, Masser urged board members to move away from divisiveness and come together. "I hope we can continue to come together to strengthen and improve our university," says Masser. Earlier in the meeting, Joel Myers, chair of the outreach, development and community relations committee and president of AccuWeather, made personal, prepared remarks regarding the approach the board and university should take moving forward. Specifically, Myers urged unification, transparency and healthy debate and dialogue, including doing "a better job of listening to the other side." He also says it's critical to highlight the positive happenings at Penn State. "The Penn State community must stand united. ... Now is the time to put the 'we' back into 'we are,'" says Myers. - Ratification of the restoration plan for Lake Perez at Stone Valley Recreation Area. The cost of the project increased from $4.1 million to $5.5 million. Part of the increase is due to higher than expected bids and more materials than anticipated. Penn State drained the popular lake in Barree Township, Huntingdon County after the discovery of a leak in its dam. The lake is expected to be refilled this spring after repairs are completed. - Second phase of an expansion at the Intramural Building, which will include a new gymnasium and running track. It will also include repurposing the existing court into a multi-purpose court. The locker rooms will also be renovated. The majority of the $53 million project will be funded through student fees. The first phase, which is underway, includes the construction of a 48,000-square-foot addition. - Appointment of Stantec as the architect for the Baker Building where extensive renovations are planned, including replacement of the HCAV systems, updating restrooms to be compliant with the Americans with Disabilities Act and roof maintenance. - Final plans for renovations at the Mueller Building, which is where the biology department is housed. The seven-story building was constructed in 1965 and has "inadequate" accommodations for students. The $20.7 million project will include new labs for students and faculty. - Renovations at the Burrowes Building adjacent to Pattee Library starting in February. The renovations will be primarily interior. The project also includes demolition of the connections between the main building and two wings to improve pedestrian access. The new connections will be mostly glass, changing the building's facade. In other news, Susan McHale, professor of human development and director of the Social Science Research Institute, addressed the board regarding the Network on Child Protection and Well-Being. In 2012, the Presidential Task Force on Child Maltreatment established the network. The network is in the process of recruiting faculty with expertise in child abuse and neglect. The goal, McHale says, is to have 12 faculty members as part of the program. Additionally, the network intends to conduct research to better understand the effects of child abuse. "What we know much less about are the psychological impacts. This is where the science is needed," says McHale. "... We are going to make advances in solving this complex problem of child abuse ... to make folks like you have another reason to be proud of Penn State." The third annual conference for the network will be held May 5 and May 6 at the Nittany Lion Inn. 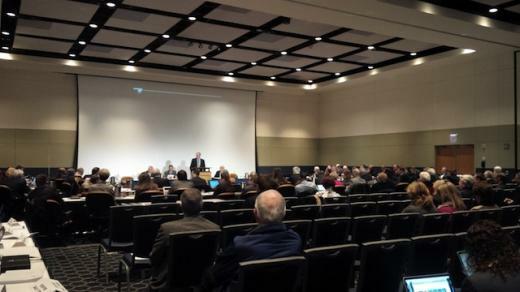 Penn State President Rodney Erickson also addressed the board, saying the university's financial standing continues to improve. In December, Standard & Poor's increased Penn State's outlook from negative to stable. Erickson also says admission is up after last year's dip with applicants for undergraduate degrees up 19 percent at University Park and applications to Schreyer Honors College are up 29 percent. Erickson also wished former Penn State coaches Bill O'Brien and Larry Johnson well with their new positions at other programs. Erickson's contract ends in June, which is when he is expected to retire. Masser said Friday the board is on track to hire a new president in the coming months. Additionally, new head football coach James Franklin spoke at the beginning of the meeting. "I can't tell you how excited myself and my family are about being part of this community," Franklin says. "There is nobody that is going to work harder to make you guys all proud, that's on the field, that's off the field. ... 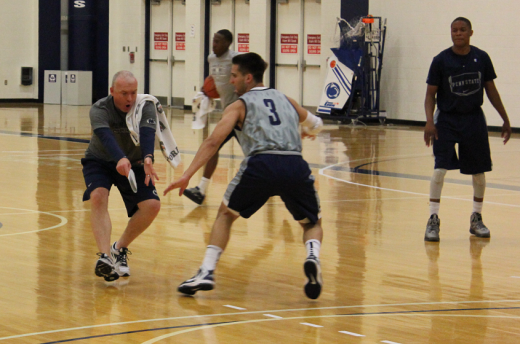 I'm a Pennsylvania boy with a Penn State heart and I couldn't be more proud to be your coach."